Jakobshavn I (2016), by Justin Brice Guariglia. Art selfies have arrived! And they are welcome to stay, so long as we are mindful of the artworks nearby. Just because cultural institutions are thinking outside-the-box, embracing new technologies and millennial-inspired ideas doesn’t mean the golden rule stopped applying: Look, don’t touch. This is not photography’s year. Then again, Earth Works: Mapping the Anthropocene, now at the Norton, is a tough act to follow and more than makes up for the low number of photographic shows this season. Several exhibitions seem to have aligned — or conspired — to bring forward the lesser-known artistic side of high-profile names already known for their business or political contributions. This year is no different from previous ones except for the fact that many of us have renewed our appreciation for all things beautiful, solid and housed under A/C. Now that we have witnessed up close and from afar the ugly, messy aftermath left by some serious hurricanes, it is a relief to find that our local art venues fared well, despite having façades exposed and sculptures displayed outdoors. Maybe a close call is all it takes to not take them for granted. Norton Museum of Art, West Palm Beach: That humanity plays a significant role in the deterioration of the planet is a fact, not a question, posed by the 22 photographs making up the museum’s first exhibition of the season. Earth Works: Mapping the Anthropocene (now through Jan. 7) is the product of Justin Brice Guariglia, a transdisciplinary Brooklyn-based artist, who in 2015 and 2016, flew seven times with NASA on a survey mission of Greenland to study the effect of melting glaciers on sea level rise. The Anthropocene refers to the geological period during which humans have left a permanent mark on the entire planet. The detail of Greenland’s melting and weakened glacial ice sheets and sea ice is partially achieved by the monumental size of some of the works, which stand at 12 x 16 feet. Gertrude Vanderbilt Whitney: Sculpture (Jan. 25-April 29) introduces us to the lesser known passion of a prominent art figure best known as the founder of New York’s Whitney Museum of American Art. From her earliest classical sculptures to her more symbolic public monuments, the show presents Whitney’s sculpting art through 40 works portraying the unemployed, working-class people, African-Americans and scenes of World War I. This is also the first exhibition of Whitney’s art since her death in 1942. Despite the little acknowledgement she received as an artist, the famous art patron exhibited throughout the United States and Europe. A series of intimate shorter exhibitions are also planned under Spotlight, the museum’s name for occasional explorations of specific large-scale works and recent acquisitions. They include Julie Mehretu: Epigraph, Damascus (now through Oct. 22) which showcases a newly acquired 2016 six-panel print by an Ethiopian artist. Mehretu is known for gestural abstract compositions that convey an emotional and a deeply expressive commentary on current events. For this work, she incorporated a series of deconstructed architectural renderings of Damascus, Syria. 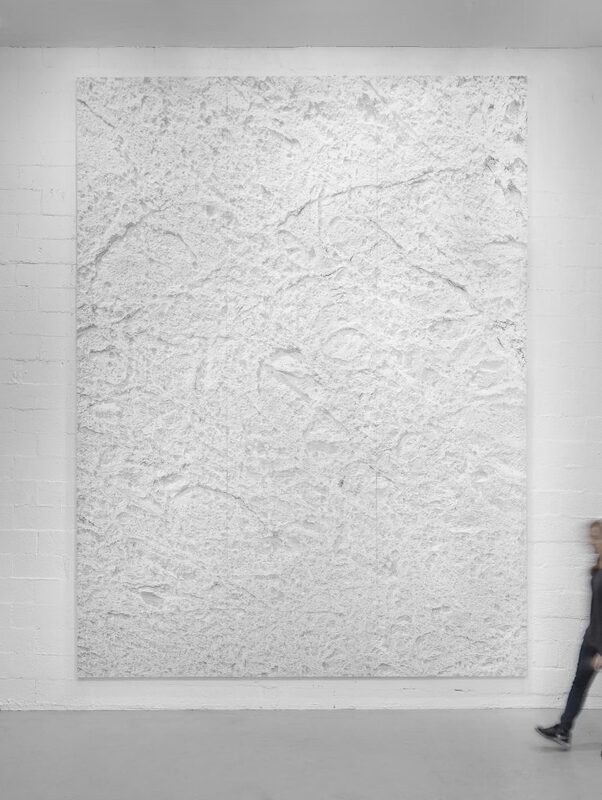 Architectural renderings and aerial views of urban grids often find their way into her paintings and drawings, which also tend to exhibit a calligraphic complexity. Late October brings us bold works by contemporary artists, among them Dale Chihuly and Michael Craig-Martin, will go on display next with Brilliant: Recent Acquisitions (Oct. 26–Dec. 10). The show will include works on paper, glass and photography with one characteristic in common: dramatic use of color. The museum ends the year with miniature artworks by Julian Schnabel, Philip Taaffe and Cy Twombly. On view Dec. 14 through Feb. 4 is a peculiar exhibition titled after the hobby of a local art collector’s mother. Miss Lucy’s 3-Day Dollhouse Party consists of works commissioned by Douglas Andrews to hang on the interior walls of his mother’s dollhouses. A last-minute opportunity seized by the museum affords us some quality time with Basquiat’s Dog Man. Presented under the Spotlight series, Jean-Michel Basquiat: Drawing into Painting (Feb. 8–March 18) focuses on this 1986 work and pairs it with four drawings from private collections. 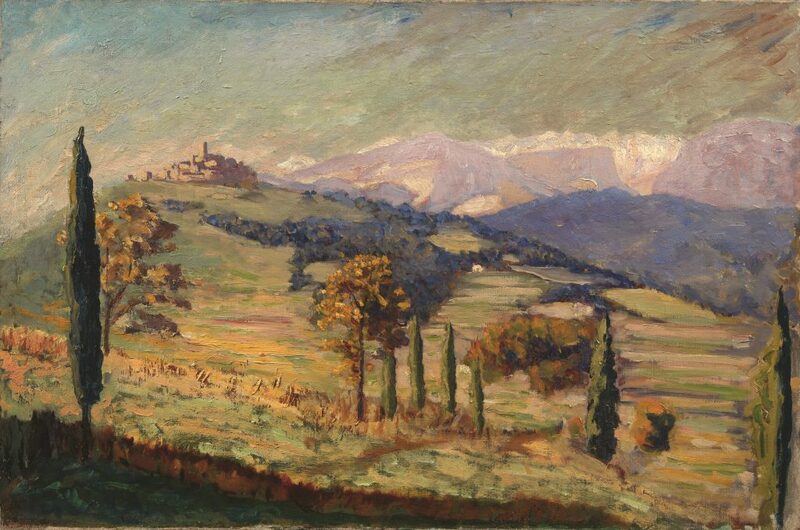 Distant View of Èze (1930), by Winston Churchill. Society of the Four Arts, Palm Beach: Turns out George W. Bush isn’t alone in being a high-profile political figure to have developed an affinity for painting. A Man for All Seasons: The Art of Winston Churchill (Dec. 1-Jan. 14) presents the man’s softer side through 28 paintings. Having stumbled upon a new passion by chance, the famous British prime minister turned to painting for relief and comfort. The show is only a sample of the more than 500 works of art Churchill went on to create and includes rare photos, film clips and memorabilia. Elaborate gowns and iconic costumes typically worn by historical figures in flattened portraits step out of the canvas and stand up on their own thanks to the vision of a highly skilled Belgian artist known for her intricate paper sculptures. Isabelle de Borchgrave: Fashioning Art from Paper (Jan. 26-April 15) examines six centuries of fashion from Elizabeth I and Marie-Antoinette to Christian Dior and Coco Chanel through beautifully conceived paper mannequins sporting period dresses rich in detail and color. Giant Pipes (1936), by Margaret Bourke-White. Boca Raton Museum of Art, Boca Raton: Cuban artist Carlos Luna continues to treat viewers to vivid painted accounts featuring roosters, farmers, horses and guns. Deep Line Drawings (now through Dec. 31) features a new body of work featuring intense colors and bold lines. Employing a technique dating back to Pre-Columbian times, Luna did the works on amate paper, which is handmade in Mexico from natural tree bark. Strange is an understatement when it comes to Patricia Nix: American Baroque (through Oct. 22). Magical is another way to put it. Or maybe they are just beautiful accidents? You get to decide. 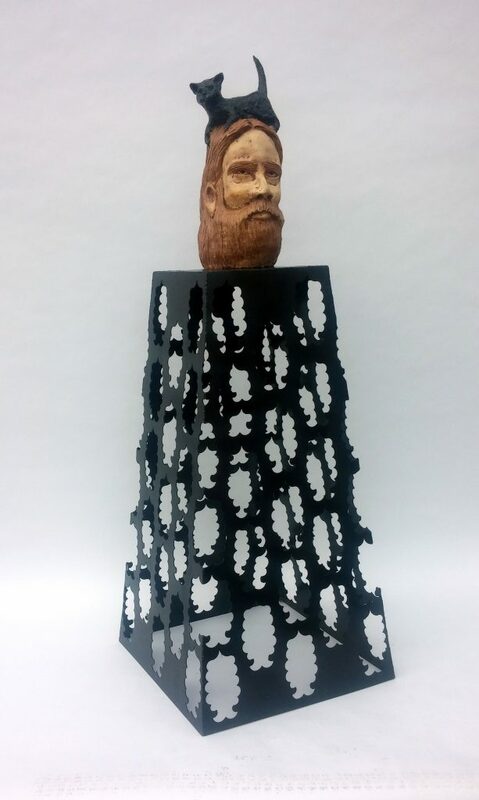 The native Texan, whose early influences include Southwestern churches, Mexican icons, and Native American crafts, is known for finding ironic and psychological interpretations in the materials she collects and later turns into constructions that, in the show, emerge as intricate vertical altars asking to be fed one more object, one more sacrifice. Running simultaneously is a solo exhibition by Iranian photographer and filmmaker Shirin Neshat featuring a two-channel video projection and a series of large-scale photographs highlighting how current extreme interpretation of Shiite law has robbed women and a country of a rich tradition of female performers and the joy of singing in public. Shirin Neshat: Turbulent and Fervor explores gender relationships in Iran through music and performance. An important portion of the museum’s photographic collection is also on view through Oct. 22. Photographs from the Bequest of Isadore and Kelly Friedman celebrates the role of an art collector and the 100-photograph gift he and his wife handed the museum in 2006. The Friedmans’ donation is the largest gift of American and European art ever presented to the museum. 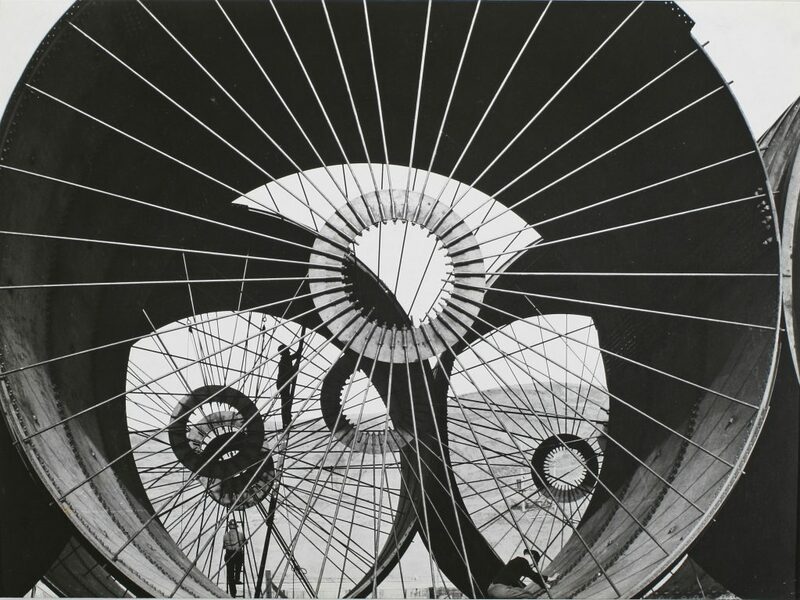 Works by Edward Steichen, Brassaï, Margaret Bourke-White, Robert Robert Doisneau, Dorothea Lange, Alfred Stieglitz, and Helmut Newton are included in the show. The next exhibition should come with a disclaimer: “No large-scale paintings were hurt or shrunk during installation.” Instead of the famous large-scale versions, Alex Katz: Small Paintings (Nov. 6-April 8) features small oil paintings by the renowned American figurative artist who started out sketching subway passengers and didn’t try to fit into any movement unless it was “Katz-ism,” as he said in 1986. The show will aid a more intimate connection with an artist known for clean lines, flat portrayals of friends, his wife and the Maine landscape and no other mission other than capturing the surface of things. Regarding George Ohr: Contemporary Ceramics in the Spirit of the Mad Potter brings together 24 unique works, many of which have not been exhibited in public before. Objects by contemporary artists working in the same spirit of testing the versatility of ceramics will accompany the pieces by the American ceramic artist self-proclaimed as Mad Potter of Biloxi. The show will run Nov. 6 through April 8. A newly created series dedicated to emerging and mid-career photographic talent will premiere and run during this same time. The first Contemporary Photography Forum exhibition includes the work of Daniel Gordon, from Brooklyn; Paul Kneale, from Canada; and Florian Maier-Aichen, from Germany. Don’t expect this to be a photography exhibition in the traditional sense. Photography is merely the starting point for these three artists. Sculpture, Drawings and Paintings by Arthur Carter (Jan. 8-April 8) shares the latest passions of a prominent banker and businessman who served in the U.S. Coast Guard and trained as a classical pianist before turning solo artist, between publishing jobs. The paintings and drawings on display will shine a light on the thought process leading to his mechanical creations, which are known for their minimal use of materials and precision. Cover of George Bruce’s Squadron: Stories of War in the Air (1933), by Frank Tinsley. Flagler Museum, Palm Beach: Leave it to art to pull something beautiful and romantic out of the dark rubble of war. Artworks, postcards, artifacts and newspapers do the talking in Knights of the Air: Aviator Heroes of World War I (Oct. 17–Dec. 31), an exhibition designed to honor the image of the daring, adventurous pilot on the 100th anniversary of America’s entry into World War I. 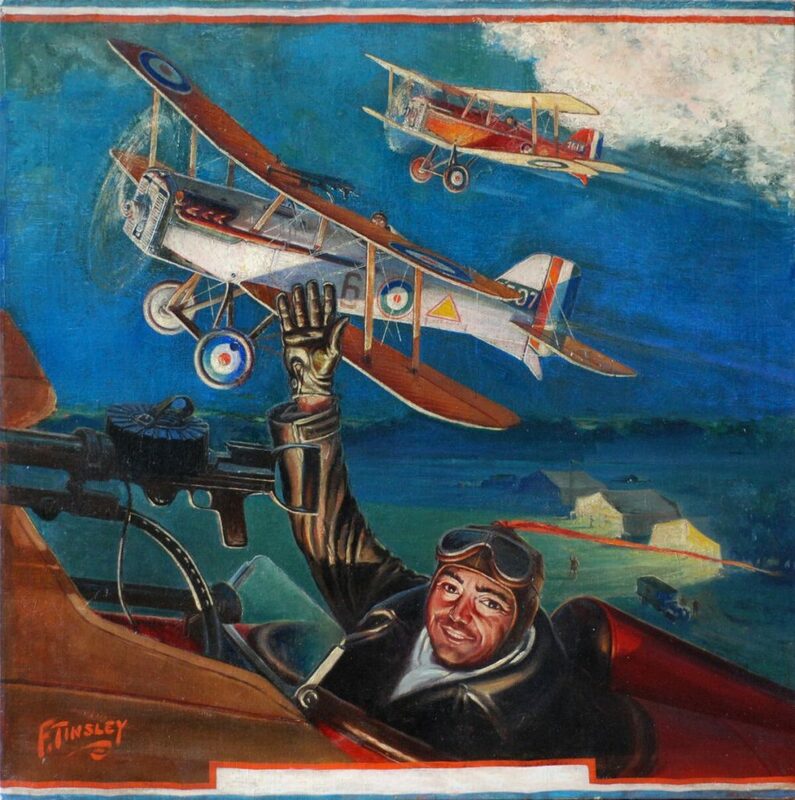 Driven by adrenalin and patriotism, WWI pilots, whose typical life expectancy while flying was weeks, were immortalized through popular pulp magazines and Hollywood films and went on to inspire many future aviators. The museum’s winter exhibition is another first of its kind. It will draw attention to the work of Ignaz Marcel Gaugengigl, a Boston School painter and printmaker known for evocative depictions of everyday life often set in revolutionary-era France. Masterfully Human: The Art of Gaugengigl (Jan. 23-April 29) will feature more than 80 works and explore the Gilded Age artist’s take on universal concepts such as beauty, love and friendship. Bavarian by birth, Gaugengigl’s body of work includes landscapes, portraiture, illustration, and design. Morikami Museum and Japanese Gardens: Indigo-dyed kimonos, samurai jackets, firemen’s coats and futon covers kick off the museum’s lineup with a show devoted entirely to the use and history of indigo dye (aizome) in Japan. Out of the Blue: Japanese Indigo Textiles (Oct. 19-Jan. 21) dusts off and revisits a practice believed at one point to have protected farmers from mosquitoes and other fieldwork threats. Textiles and costumes give way to flower vases, tea bowls and candle holders with Nature, Tradition and Innovation: Contemporary Japanese Ceramics from the Gordon Brodfuehrer Collection (Feb.17-April 22). They are only a few of the 55 ceramic pieces by 43 Japanese artists who insist on rejuvenating the old with modern, fresh interpretations. The show will bring us the latest news on a traditional art form that hasn’t stopped evolving and continues to grow when we are not looking. During the despotic Edo period, few things offered the Japanese people respite and were tolerated by the government. Humor — seven categories of it — to be exact, was one of them. On view May 19 through Aug. 26, Seven Smiles: Humor in Japanese Paintings concentrates on visual representations of Parody, Satire, Personification, Word-Play, Fantasy, Exaggeration, and Playfulness. The role of humor as escape and muse gets explored through 48 paintings by famous artists such as Sōtatsu, Shōhaku and Kodōjin. Hard Bodies: Contemporary Japanese Lacquer Sculpture, the first-ever comprehensive exhibition of contemporary Japanese lacquer sculpture, follows from Sept. 29, 2018, through Jan. 20, 2019, with 30 large-scale lacquer sculptures by 16 artists who enjoy pushing the limits of the medium. The Catalyst, by Andy Denton. Armory Art Center, West Palm Beach: Faculty from Ringling College and the Armory will trade places and exhibit at each other’s facilities beginning Oct. 21 through Nov. 24. West to East Exchange: Ringling College of Art + Design at the Armory will showcase works in painting, drawing, printmaking, digital media, and sculpture at both locations. Running simultaneously at the Montgomery Hall is Artistic Happenings: WITVA 2017, an open, juried exhibition sponsored by Women in the Visual Arts (WITVA) featuring all media including painting, photography, ceramics, glass, and sculpture. The Social Set: Paintings, Drawings and Videos by Sam Perry (Dec. 2-Jan. 6) is a multimedia exhibit highlighting the works of the longest-serving faculty member and FAU graduate who grew up in Northwood. Meanwhile, Textile Meditations: Mary Fisher and Friends (Jan. 20-Feb. 10) will focus on the works of friends and artists Jan Beaney, Jean Littlejohn, Jane Dunnewold and Marsha Christo, who share a passion for textile construction. Artists-in-Residence Exhibition (Feb. 17-March 9) will introduce the works created by the invited artists during the eight-month tenure. This year’s residents are Amber Dawn Tutwiler in painting/drawing, Maria Tritico in jewelry/metalsmithing, Nate Ditzler in ceramics, and Andy Denton in sculpture. The 2018 Scholastic Art & Writing Awards Exhibition: EG2 will feature the winning submissions for the Palm Beach and Martin County Regional 2018 Scholastic Art and Writing Awards competition, the largest of its kind for middle and high school students in the country. It will be on view Feb. 24 through March 9. The winners go on to exhibit in New York City in May and get recognized at an awards ceremony in Carnegie Hall. The Armory Faculty Show and All Student Show, both running March 17-April 14, will present works in all media by Armory Art Center faculty members and their students. The Lighthouse ArtCenter, Tequesta: New works by the School of Art’s expanded faculty are on view through Oct. 28 with 2017 Faculty, Ceramics and 3DExhibition. In time for the holidays comes Elegant Threads: Wearable Art and Surface Design Exhibition, an exhibition dedicated to quilts, textile accessories and wall hangings running Nov. 2 through Dec. 9 and featuring artists from around the world. The ArtCenter ends the year and welcomes the new one with a show celebrating Treasure Coast local talent. Jupiter Island Artists Exhibition (Dec. 14- Jan. 18) will feature works by resident painters, sculptors and collectors. Arrived: Florida Artists Emerged, featuring a selected group of Florida artists of international acclaim will follow Jan. 25-Feb. 24. They include Xavier Cortada (Miami), Sarah Crooks (Jacksonville), Mary Grand Pré (Sarasota), Cheryl Maeder (Palm Beach), and Margaret Ross Tolbert (Gainesville). The annual tradition of featuring promising young talent from public and private schools and ages 5 through 18, returns May 2-25 with the 48th Annual Kindergarten through 12th Grade Show. Cultural Council of Palm Beach County: Works by 14 Palm Beach Gardens artists are the focus of Made in Palm Beach Gardens, a show running through Nov. 18 dedicated to cities in Palm Beach County. The Lawrence A. Sanders Foundation Artist Resource Center will be home to a series of solo exhibitions, starting with Sami Makela (through Oct. 28), a graffiti mural artist born in Helsinki who moved to Paris in the early 1990s to seek inspiration and now has an art studio in Lake Worth. His body of work includes decorative painting and assemblage. Running simultaneously will be works by Dennis A. Bertram, a late bloomer artist who attended Johns Hopkins University and held faculty positions there and at the University of Buffalo before deciding to pursue art full time. The geometric style landscapes he is now known for only evolved in the year 2000 out of his dissatisfaction for naturalistic renditions. Ann Norton Sculpture Gardens: Now on view through Nov. 26 is a selection of Ann Norton’s drawings and pastels, maquettes, and finished sculptures. Ann Weaver Norton: Gateways to Modernism explores this woman’s artistic transformation and the technical evolution that turned her small-scale works into larger abstractions in brick, wood and granite. A flower, as source of chaos and symbol of beauty, sits at the core of Gordon Cheung: New Order “Vanitas” (Dec. 9–Feb. 4). His series of paintings and prints known as Breaking Tulips are inspired and informed by the Flemish and Dutch masters of the 17th century, a period also known for the financial disaster sparked by the pursuit for this exotic flower. 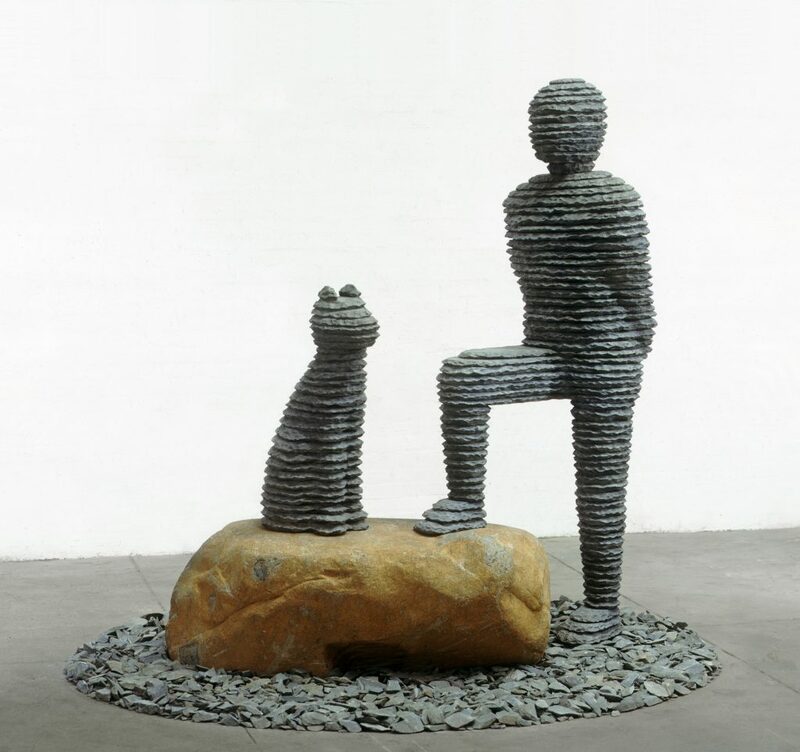 Celebrating Boaz Vaadia (1951-2017) will follow Jan. 11 through April 29 with an exploration of the Israeli-American artist and sculptor who died earlier this year and was best known for the figurative sculptures he made by carving and stacking stones that he found outside his New York studio. Primarily named after biblical figures, his public works can be found outdoors in parks and in front of public buildings, as well as in the collections of the Metropolitan Museum of Art, the Bass Museum of Art, and the Tel Aviv Museum, among others. Cornell Museum, Delray Beach: Reflection is the protagonist of a group exhibition – the first in the museum’s renovated galleries — inviting viewers to see themselves in the art or the space around the art piece. Art selfies are welcome at Looking Glass, which runs Nov. 9 through Feb. 25. Another group exhibition follows March 8 through July 29 but this time, nature is the inspiration. Flora features contemporary art documenting plant life and flowers in their various stages, from blossom to decay. Florida Atlantic University: The notions of “togetherness,” “relationships” and “home” are studied in Home Mask Relations: A Social Art Project by Danish Textile Artist Isabel Berglund, which will run Nov. 4 through Jan. 20 at the Schmidt Center Gallery. The centerpiece is a large-scale installation comprised of individual hand-knitted panels joined together with threads. Using the practice of knitting as a guide, the artist aims to eradicate socioeco¬nomic and political barriers dividing people. The 2018 edition of southXeast: contemporary southeastern art will run Jan. 20 through March 3 at the Ritter Art Gallery and Feb. 2 through March 24 at the Schmidt Center Gallery. The show introduces students and the general public to a body of work not commonly or ever seen in South Florida by emerging and underrepresented mid-career artists from several Southeastern states. Art fairs: This year, we are treated to the brand-new Palm Beach Art, Antique & Design Show, which will debut December 15-17 at the Palm Beach Art, Antique & Design Showroom in Lake Worth. The show will feature prominent collections of fine art, furniture, decorative objects, sculpture, and textiles. International exhibitors, such as Butchoff Antiques (London) and Villa del Arte (Barcelona) as well as domestic dealers such as Nicolo Melissa Antiques (New York), Colm Rowan Fine Art (Philadelphia) and Daniel’s Antiques (Ft. Lauderdale) will be participating. Meanwhile, the five-day celebration we have come to know as ArtPalmBeach will return to the Palm Beach County Convention Center Jan. 17-21 for its 21st edition. Palm Beach Jewelry, Art & Antique Show will follow Feb. 14-20 with more than 170 international exhibitors while creations by top contemporary craft artists will take over Feb. 16-18 with the Palm Beach Fine Craft Show.